The prospect of participating in the fight against poverty can be overwhelming. Most people have full lives that prevent them from becoming “activists.” They have difficulty imagining what they can do beyond sending donation checks and writing politicians. 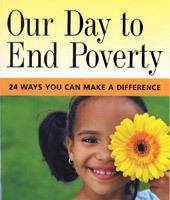 Our Day to End Poverty (Berrett Kohler, 2007) by Shannon Daley-Harris and Jeffrey Keenan ’83 describes “24 ways you can make a difference.” This book shows how individuals can contribute to poverty relief on international, community, and individual levels, whether they’re preparing breakfast, driving kids to school, donating clothes or an old computer, or just checking email. The book’s myriad inventive solutions reveal that people can help save lives whether they choose to make one small change or take what Keenan calls “the deep dive” in giving. When Arthur Brooks, son of the late Professor David Brooks ’58 of Seattle Pacific University’s Mathematics Department and Jackie Hansen Brooks ’57, gave a lecture on campus recently, he strove to clear up a misunderstanding. Brooks says he was surprised by these results of his number-crunching. 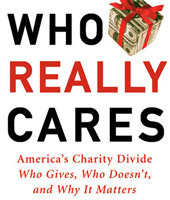 What is more, his research revealed that those who give are happier and healthier. Brooks encourages people to ask themselves, “What act of service could I do this week that would create the most value and meaning?” He further examines the rewards of giving in his next book, Gross National Happiness, coming in April from Basic Books.